Golf is a great drill (or game) to use when you want to focus on your speed and efficiency. I think it is particularly useful to triathletes because it gives them a way to measure if they are sacrificing “easy speed” for longer strokes or if they are spending too much energy at the expense of smoother swimming. To play golf, add your stroke count to your time. The goal is to have a low score, i.e. balance long strokes with fast swimming. There are no set distances, but I find it works best with 50s. There is no handicap. If you swim in a group, golf can be a fun way to compete with your friends. If you train alone, you can always try to beat your own score. When I have my swimmers do golf sets, I usually have them do at least 4 to 6 repetitions so that they can try to beat their score each time. Sometimes it takes a little while to find the right rhythm, so it is important that you do enough repetitions to allow you to time experiment, especially if you are new to pace work. Long strokes are efficient because you’re getting a great amount of distance per stroke but the trade off is that you’re not swimming as fast as you can with a higher stroke rate. If the stroke rate is too much, the athlete will be spinning their arms, which is physically taxing and less efficient. Like so many things, when you play golf in the pool, the trick is to find balance: swimming as fast as you can with the lowest stroke rate possible. The following is an example golf set paired with example scores and “meaning” behind the scores. Lets say the athlete swims the first 50 in :35 seconds with only 21 strokes per 50. Their golf score is 56. The 50 was very smooth and relaxed, and not at all physically taxing. They could maintain that stroke rate and speed for a long time. Maybe on the second 50 they decide to just go for it. The 50 takes them :26 seconds, but they took 32 strokes per 50. Their golf score is now a 58. They’ve gone significantly faster, but at great physical cost. They could not maintain that stroke rate or speed for very long. On the third 50, they try to maintain their speed while simulating the long strokes they had in the first 50. This time, it takes them :29 seconds and they only took 26 strokes per 50. Now their golf score is 55. They’re pretty happy with their score but are also feeling more warmed up. On the next 50, they think about the small things like their streamlines off the wall. They also work on a strong catch as well as accelerating through a long finish. This time, they swim the 50 in :28 seconds and take only 25 strokes. They have found a great balancing point and their new golf score is 53. The best part is that as they continue to practice golf sets, it becomes easier for them to settle into a their rhythm sooner in the set, workout, or race. Their pace work becomes more consistent as they become more confident and develop a better feel for the water. When you play golf in the pool: experiment. Go ahead and swim as fast as possible so you know how much energy it takes and how many strokes were needed. You should also try to swim with the least amounts of strokes possible so you can feel how drastically different they are. One is taxing. One is just too slow. Golf is particularly useful to triathletes. Triathletes don’t typically sprint the water portion of their race, so balancing speed and efficiency is a very useful skill for them to develop. 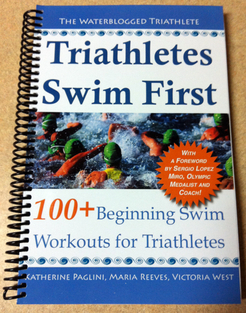 ‹ How Can We Help Your Swimming Improve in 2013? I have done a version if this, but this post has a great depth in finding a rhythm. Thanks! I think it is an important skill for any swimmer to develop/ be aware of. It seems to be a great drill for you to work on at this particular stage of your swimming development based on recent blog posts you’ve written. It isn’t just for triathletes though, I was able to use my findings during golf to become a better 50 freestyler! (I average 10 per 25, sometimes down to 8). So I have a question about the first drill. I was told by my LLS TNT coach that I should not stroke past my hip and, if I remember right, that my elbow should come up before my hand. The concept is similar to paddling a canoe. The longer behind the hip a paddle is in the water, the more the motion actually pulls down the body (or back of the boat); thereby, slowing forward progress through the water. It does work that way in paddling, but does it with swimming? Pushing water up to the ceiling means something is being pushed down, right? Or am I missing the point of the stroke? My sister does this and she is called the human torpedo at the YMCA camp (she is a lifelong swimmer, my inspiration, and pure awesomeness).